His book Deschooling Society took on the education establishment, and he had equal contempt for the medical establishment, both of which upheld lifestyles that in the end were harmful to people. He was, it seems, an unwitting part of the Catholic social justice movement, but was able to rise beyond the dogma with a critique of World Bank do-gooderism echoed by Robert Lupton’s Toxic Charity. 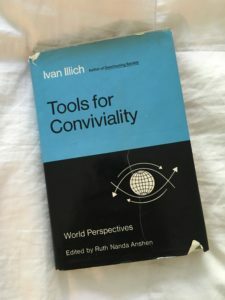 Tools For Conviviality (Harper & Row, 1973) was the book that tried to give Illich’s way of moving forward, calling “conviviality” the ability to use tools to create your own God-given vision of the world. Illich, who died in 2002, equated the liberal war on poverty with the Vietnam war, seeing both as escalating the problem they were meaning to fix. Cars and mechanical vehicles, he observed, had created more distances between people than time saved. Instead, he envisioned that autonomous individuals would satisfy the human needs that they also determine. 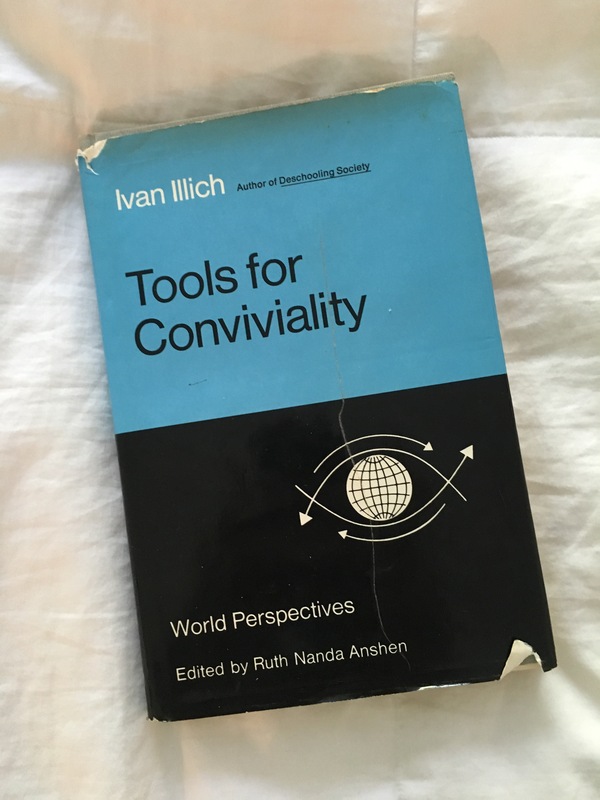 Today, looking at his dislike of corporate medicine, we can see that Illich may not have anticipated all of the advances of the last 40 years. But his basic idea that clean water, soap, a balanced diet and fresh air create have created far more improvements to health that some medical advances remains true. Those who work in hospitals, and are forced to treat obese people who eat packaged food and soda for things like heart conditions, or alcoholics who have alcohol-related issues, will sympathize. Interesting ideas include the thought that prisoners are deprived of conviviality, and become, at their most pure state, consumers. He advocated that we seek “joyful sobriety” and “liberating austerity” as antidotes. This idea presages today’s attempts at “cutting the cord” on cable TV, the “tiny house” movement, the backyard chicken craze or other attempts at going beyond prescribed and professionalized consumer behavior. Minds could be “industrially distorted” so that they could no longer anticipate the possible riches of other modes of thought. This describes those of us who feel they are in a rut of consumer debt, endless overtime work, and frayed personal relationships. The system, which keeps us in William Wordsworth’s “getting and spending” mode, is hard to undo. 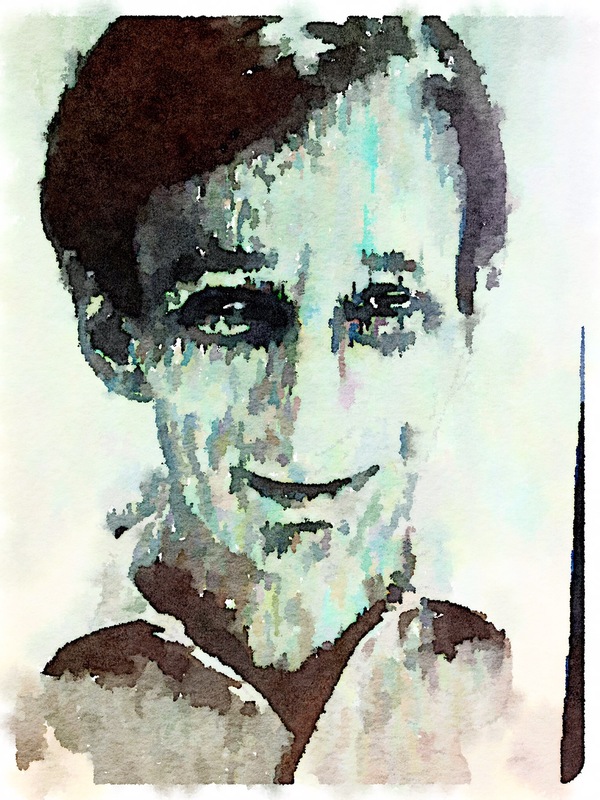 Unfortunately, Illich did not exactly describe what his ideal future would look like, instead he provided “guidelines for action and not fantasy.” He had a perhaps cultural liberation theology bent for socialism, though he was equally critical of Mao, Stalin and others. And he knew that the overseer class that rule us could not be overthrown by mass slaughter. Instead, new ideas had to replace them by voluntary choice. Corporate professional education, he thought, had turned into some sort of medieval alchemy trick, that would “bring forth a new type of man who would fit into an environment created by scientific magic.” Instead, the commodities called “education” and “school” had been turned into self-reinforcing mechanical processes that enslave men. Those who dropped out, then, are less valuable than more important people who are able to continue on. Those with less than 12 years education must have social workers determine how and where they live. Tools are a key to the future. When a man masters tools, he can “invest the world with his meaning.” But if a man is mastered by his tools, the tool determines him. Today, perhaps the popularity of the pickup truck, Home Depot, Tractor Supply, Harbor Freight and do-it-yourself careers shows how Illich is winning in one sector. The working man sees these places as freedom, where a man can determine his identity. Illich was not anti-technology, and saw the telephone as a democratizing tool. But these advances could be abused, for instance in situations where cars become so complex that planned obsolescent vehicles could no longer be fixed with simple tools. Trains, for instance, still need to run on schedules and with predefined rules. And if container ships were replaced by sailing ships, his idealized society would become more restrictive, not less. He saw how advances had changed theology; our Biblical rules against usury had fallen when borrowed capital could suddenly work, and bear fruit for society. He was critical of the legal protections of the building trades, which canceled out the newly possible advances of the self-builder. He reminds that in 1945, fully 32 percent of all houses in Massachusetts were self built, but by 1970 and increased building codes, housing shortages had become a major problem. I see this today, when I see enormous “luxury” apartment buildings built in Florida, with wood frames. How can this be code and luxury? He was also critic of our end-of-death rules; morticians have monopolized the burial of bodies. We can see the result today, as dying has become so expensive and consumer focused that this industry has destroyed the Christ-emulating traditional Christian practice of burial in favor of once-verboten cremation. Language is one tool that we can use to fight these monopolies. Schools like “education” but instead we need to always ask what children “learn.” Ordinary English, then, is a weapon, one that Donald Trump has used to great effect as he attracts those who have been left out of a bureaucratized professional class ruling from Washington.